It’s true, Express Avenue is the best place to go shopping in Chennai. It’s in the heart of the city and the mall has so much to do, in fact, it only keeps expanding with more stores opening. But there is so much more to do in Express Avenue (EA as it is fondly called) than just shopping. You can spend an entire day doing non-shopping related things and still come away feeling like you had a blast! Like all malls, EA also has it’s fair share of coffee shops and cafes where you can sit down and rest for a few minutes or even longer if you wish. There’s a Starbucks on the ground floor and while it’s not very large, it’s definitely crowded at all times. If you’re looking for something different, why not visit Krispy Kreme on the same floor. They’ve got milkshakes in those glass bottles that you can take home with you, which already makes it even more special. And if you’re looking to have a cup of coffee, a slice of cake and just sink into plush couches, Café Glitterati might just be where you need to go. Your food options don’t end there! On the third floor, there’s a huge food court that has every popular restaurant you can think of, serving all kinds of cuisines and even desserts. You’ve got Burger King, KFC, Dominos, and Subway to choose from, along with Dasa Dozza, Cream Stone, Wangs Kitchen and so much more. There’s also a Chili’s – an American Tex-Mex restaurant – and a Café Coffee Day to dine at. When Sathyam opened their multi-screen cinema on the third floor of Express Avenue, it was the best thing to ever happen to moviegoers! You get to go shopping, get some food and then watch a movie. Escape has eight screens showing movies of all languages all day. They even have an incredibly popular confectionery stand that offers popcorn, nachos, cold beverages, Indian snacks (chaat and samosas) and even ice cream! It’s an all-round experience that you won’t find anywhere else. We can’t forget the kids, of course. While the parents are shopping, the kids get to have a little fun at the open arcade. 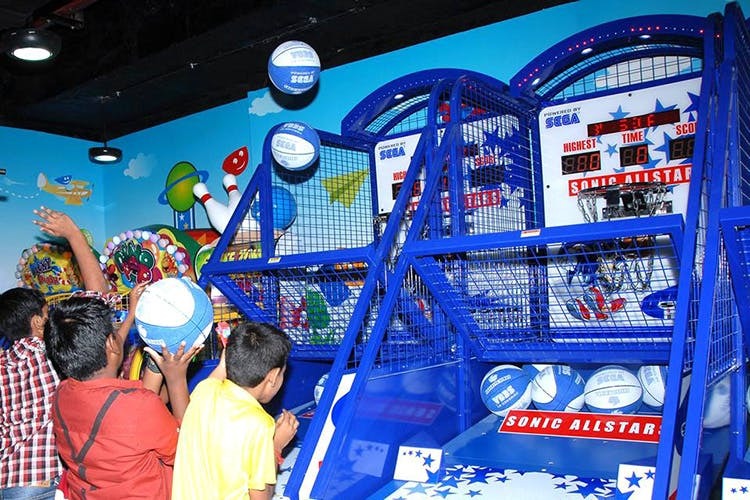 There are arcade games, a play zone for kids under the age of 12, and the chance to win big prizes in contests happening all day. There are also kiddie rides that play loud music and get the kids excited and you can be sure that when they walk out of there, they’ll want to go back in right away. Do you know what is a perfect way to end a long day? A spa treatment. At first, there was only Bliss by Oryza, which was tucked away at one end of Escape (on the third floor), but now there’s a much larger spa courtesy O2 Spa. Both spas on the third floor and both provide services like massages, facials, manicures, and pedicures. It’s the perfect way to unwind at the end of the day whether you shop or not!